If you’re like me, you may have heard of or already been to the American states of North Carolina and South Carolina. The most popular cities are really those along the west coast – classics like Charleston or Myrtle Beach – but if you find yourself with a little bit of time to spare and an interest in exploring some unique territory, I encourage you to travel to the western edge of South Carolina (yes, I know – saying that out loud is confusing, particularly since it’s really north-western – Google Maps is your friend in this case). Like many parts of western England and northern Scotland, the geography is such that you get some fantastic hiking trails that afford you great viewpoints, endless waterfalls, and just a great outdoor experience. I have to say I’ve never been anywhere in my life where I saw so many falls in such proximity, particularly around the Greenville area in South Carolina (and also crossing the border into Northern Carolina – Mother Nature doesn’t care for governmental borders so much). Here are a handful of spots you should check out while on your hiking trip. Tucked away right along the state border just north of Greenville, this area has a couple of state parks for your waterfall-hunting pleasure. Choosing a route really depends on your fitness level, as some hikes can be strenuous. Jones Gap State Park has some shorter routes if you were just up for a couple of hours of hiking, but I would encourage you to make the drive around into Caesars Head State Park, where at the park ranger’s station you can visit the lookout over the Blue Ridge Escarpment, one of the best views in South Carolina. This state park is named after its namesake – a massive boulder formation that could easily be a table in the sky. Table Rock, like Ceasars Head, affords you some fantastic viewpoints that sweep across the landscape for miles and miles; it’s a popular stop for tourists, no doubt because of the iconic rock viewpoint that is often featured in brochures and magazines. 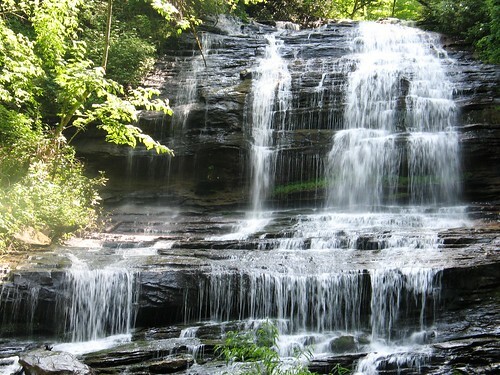 The Jocassee Gorges area, which butts up to a couple of other state parks in the area, includes an 80 mile trail through the river-lined gorges; don’t worry, you don’t have to walk the entire thing, but you do need to make sure you have a plan of attack for this expansive park. Jocassee is popular with families who want to take advantage of camping opportunities, but you can also spend some time bird watching and plant hunting; it was actually scientists that initiated the forming of this park, due to the unique flora and fauna that have established themselves here. Just a hop and a skip from North Carolina, this park is a fantastic one if you have the children with you, as there are nearby war battle re-enactments for a very visual education in addition to the woodsy hiking in the area. For those looking for a lighter walk, try a stroll around the period Piedmont farm on premises, including both the expansive gardens and animals roaming free. There’s also fishing, boating, and camping here. I’d just like to close with a mention that many state parks in South Carolina have admission fees or parking charges. These fees are nominal – typically less than £5 – and they’re for a good cause, because many of these parks run on a shoestring at best, so the price of admission is well worth it to keep these gems intact.